United Sign: You Need It.....Yesterday! Every now and again, you stumble on something you need in a hurry. Maybe something broke, maybe something needs to be updated, maybe it's a spruce up you'd like for your business or you just want to look better than the guy up the street. 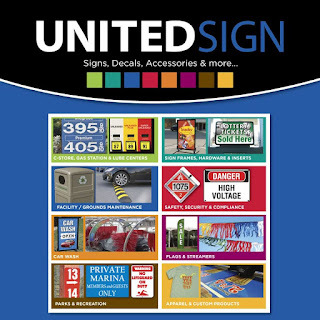 Well, this morning this blogger took it upon himself to take a stroll through the vast warehouse of in stock items we have here at United Sign and that you can have in your hands and working for you as fast as we can ship it to ya! Here's a quick gallery of a few things we have on hand, unfortunately.....I got caught roaming around taking pictures or I would have gotten one of each of the thousands of ready to roll products we offer. They might not be top of mind things for most people, but for you they help your customers know how much you offer compared to what they might come in needing. You can help people avoid areas with the pylons, let them know you can feed them and what payment methods you accept. Simple, quick and affordable. If you're looking for practical uses for this stuff, we're still pretty proud of this video from our marketing guys. Have a look at "United Gas" if you have not seen it already.